Springfield residents fondly remember the city’s Carnegie library, opened in 1904 and demolished in 1974, for some of the same features that ultimately made the building unsuitable as a library. The library was memorably described by Margaret Boswell in an Illinois State Journal story published on March 10, 1974, a few months before demolition began. The building was largely funded by steel magnate-turned-philanthropist Andrew Carnegie, who financed the construction of nearly 1,700 libraries throughout the U.S. in the late 19th and early 20th centuries. Responding to an appeal from a retired Baptist minister, the Rev. Edwin S. Walker, Carnegie in 1901 authorized a $75,000 library construction grant for Springfield. Boswell’s article goes on to deride the architecture of nearly all the early Carnegie libraries, suggesting that designers of the time prioritized grandeur and elegance, not libraries’ need to accommodate books and their readers. And it’s true that Carnegie library designs changed after 1911, when the Carnegie organization published a list of standards that essentially required architects to simplify their approaches. 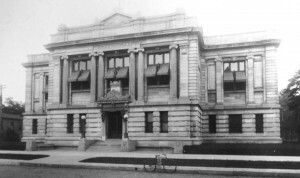 However, documents also show that the people who oversaw Springfield’s library construction built a library that, for 1904, was state-of-the-art. They sought help from outside experts, tossed out unacceptable designs, fought off political interference and included such turn-of-the-century innovations as a card catalogue and fireproof features. Blaming the building’s long-term failure solely on architectural grandiosity ignores such other factors as massive growth in demand for library services and changes in library operations. James Bertram, Carnegie’s secretary, added a note personal to Springfield. “The home of Abraham Lincoln has claims on every American, Mr. Carnegie adds, indeed on every good man,” Bertram wrote. After a follow-up appeal from Springfield, Carnegie increased his pledge to $75,000, and the city increased its minimum library budget to $7,500. The city paid $20,000 to buy the home of Dr. John Vincent at Seventh Street and Capitol Avenue as the library site, and a nine-member committee put out a call for design proposals. The committee identified three finalists, including Samuel Hanes of Springfield, but then asked Edwin Anderson of Pittsburgh’s Carnegie library to review the proposals. 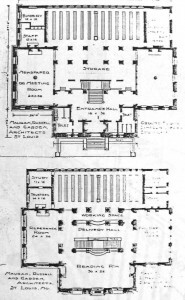 A subcommittee – Walker, John W. Bunn and Albert Salzenstein – was assigned to continue the search for a library designer, and, at the recommendation of a St. Louis library official, the panel approached the St. Louis firm of Mauran, Russell and Garden, which specialized in designing Carnegie libraries. Mauran submitted three possible designs. One would have cost more than Springfield’s $75,000 budget, but the other two were submitted to the Chicago library bureau for review. Both were “highly commended,” the Illinois State Register reported on Feb. 7, 1902, but one – the proposal the Springfield committee liked best, as it happened – “was decided to be admirable and fully recommended as in every respect adapted to library purposes.” That selection was the design that Lincoln Library lived with for the next 70 years. The Culver Construction Co. of Springfield started work on the building in 1902. 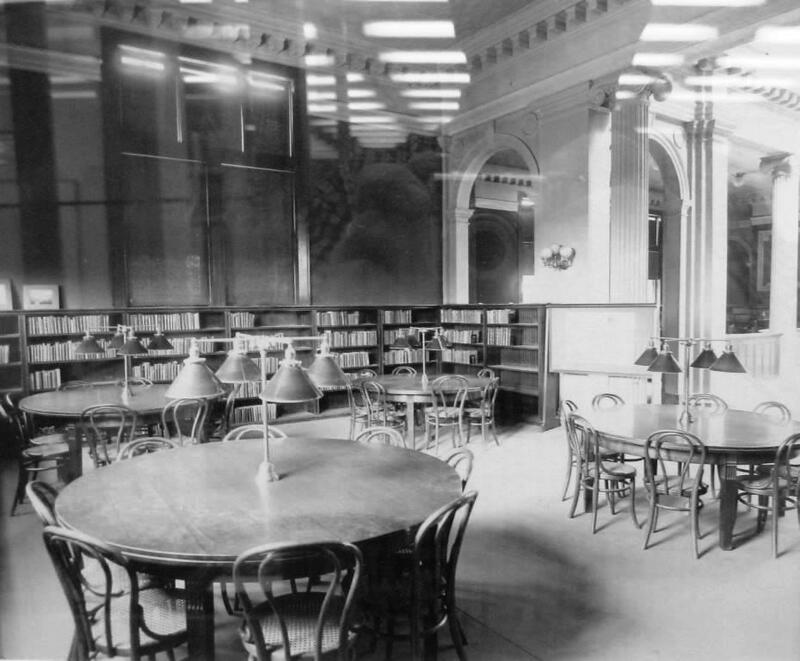 Weather, shortages of stone and labor disputes delayed the work, but the library was finally dedicated on June 7, 1904. In the center upstairs was the delivery desk – readers, who had no access to most of the library’s collection, had to ask staff members to bring books to them. 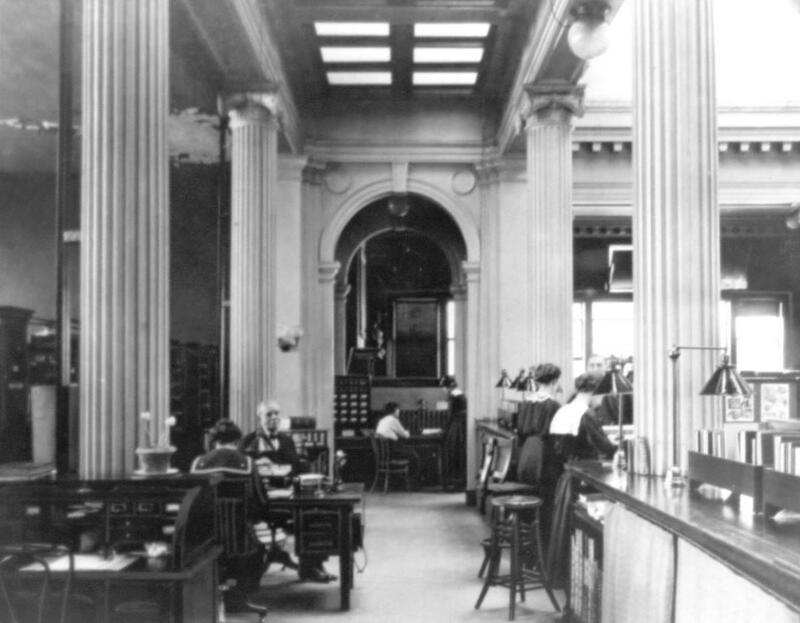 The main reading room faced Seventh Street, the reference section was in the north wing, and the children’s room flanked the delivery desk on the south. The stack room was crowded even when the building opened, according to the Illinois State Journal, but it still had room to grow. The original plans of the architect called for accommodations for 50,000 books, but, when the books were moved from the old library it was found that there was room for only about 25,000. Twelve old cases were, therefore, taken from the old library to the new, were highly polished, and these accommodate a greater portion of the remainder of the books, there being a total of about 50,000 on hand. There are two floors of the “stack room” as yet unoccupied, however. There is room for 125,000 volumes in this room. The first changes in the new library were made only six years after it opened, according to a 60th anniversary history written by longtime library public relations director Sella Morrison for the June 7, 1964, Illinois State Journal. “Remodeling has gone on ever since,” she wrote. The steel shutters disappeared in favor of people and the open shelf policy. The roof was raised to add mezzanines for more shelf space. 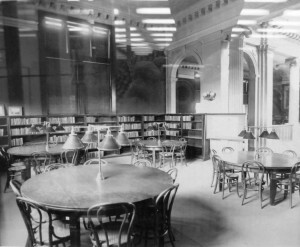 Fireplaces were closed up and disappeared behind book shelves and the library board lost its meeting room to the catalog department. “The building planned for the population and library requirements of 1904 is inadequate for the present collection, readers, and departmental requirements,” wrote Wilson, who had headed the library since 1920. Wilson wanted to tear down the Carnegie building and replace it with a completely new two-story structure at a cost of $550,000. However, Springfield had no money to build a library, and federal officials turned down Mayor John “Buddy” Kapp’s request for a Public Works Administration grant. 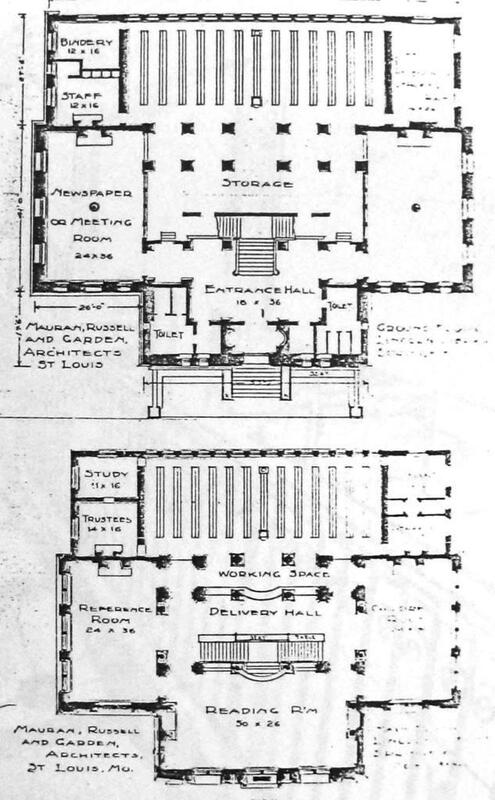 The city then explored two different plans to add onto the north side of the library, one of which went as far as the blueprint stage in 1939. That work would have cost at least $125,000, however, and attorneys told officials borrowing the money for the addition would have exceeded the city’s bond limits. The blueprints were put in storage, and, that November, a presumably discouraged Martha Wilson requested a one-year leave of absence. She never returned to the library. The Carnegie building was finally replaced in 1974 by today’s three-story (plus a basement parking garage), 90,000-square-foot library, with capacity for 440,000 books and other materials. In nostalgic retrospect, some critics have said the old library should have been left standing and repurposed and the new one built elsewhere. That idea got little consideration in the 1970s, however; the main controversy then was over financing. The city worked through the Public Building Commission to borrow the $6 million needed to construct the library, an approach that averted the need for a referendum. City officials feared voters would turn down the idea.The new facility opened on Feb. 21, 1977. 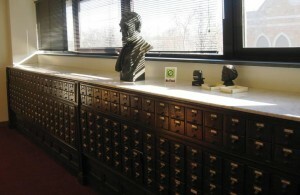 The only public reminders of the Carnegie library carried over to the new building are a grandfather clock on the first floor and, in the third-floor Sangamon Valley Collection, a bust of Abraham Lincoln that sits on the old library’s card catalogue –still in use, appropriately, for people researching local history. Illinois State Library administrator Joe Natale reviewed the history of Springfield’s Carnegie library in a pamphlet – The Lincoln Library Building, 1904-1974 – and a nearly identical article in Illinois Libraries magazine. Both publications include a confusing quotation that continues to influence other studies of the library and its architecture. The context of the quotation leaves the impression that Carnegie was referring specifically to Springfield’s library. That’s the wrong impression, but a reader has to follow Natale’s footnote to George Bobinski’s Carnegie Libraries (1969) to figure it out. Bobinski reports that Carnegie actually wrote the “I am sorry to have my money wasted” note on a clipping from a Denver newspaper showing a drawing of that city’s proposed main library. Not that many people have written about Springfield’s Carnegie library since Natale, but his truncated version of Carnegie’s comment continues to influence those who do – among them blogger/critic Leigh Kimmel (“Leviathan’s Libraries,” 1998), whose interpretation, in turn, has been cited by Illinois Times commentator James Krohe Jr. (“Monument to a dead building,” 2010) and Judy Aulik, compiler of the Illinois Carnegie Library Postcards web site (2003-14). More information: Lincoln Library – Its Genesis and Development by the Rev. Edwin Walker and The Lincoln Library Building, 1904 to 1974, by Joe Natale can be viewed in Lincoln Library’s Sangamon Valley Collection. Natale’s Illinois Libraries article can be read at the Abraham Lincoln Presidential Museum. The Sangamon Valley Collection’s vertical files also include a selection of newspaper clippings and other material about the Carnegie library, including Margaret Boswell’s 1974 story. Coverage of library construction and development also is readable through the NewsBank and GenealogyBank websites and in the microfilm sections of both Lincoln Library and the ALPL. Lincoln Library also has minutes of library board meetings in both print and microfilm versions. See also Springfield Library Association, this index. This entry was posted in Architecture, Arts and letters, Buildings, Local government. Bookmark the permalink. Judy: Thanks for following up. This old library, my childhood destination when I wanted to read, was a most beautiful building. I am fortunate to have grown up in Springfield, with many beautiful historic buildings, and the photographs of the library bring back to me the sight, sound, and smell of that time and that building. I am a Freemason and my Lodge is Ionic Lodge 186 in Duluth MN. This library and the one in Duluth are both classic examples of Ionic architecture, one of the three ancient Greek styles, along with the Doric and the Tuscan. The Ionic style is characterized by a central building with two equilateral wings on either side of the building, and adorned with the Ionic pillars. I wonder if all or most of the Carnegie libraries followed that same order? Thank you for this wonderful memory and for preserving the history of our area of Illinois. Mr. Farmer: Thank you for the interesting information. As a lifelong fan of architecture, I see the demolition of the original building as a complete waste. Although the space limitations were obvious… the glorification of a library with grand architecture certainly seems to have merit considering it impresses how important education is to a community… and no doubt part of that was Carnegie’s original intention. We’re all glad to have the 70’s Lincoln Library in Springfield but as far as style, its pretty plain and ordinary- even blah. They should have saved the building and used it for something else, or even kept it as an annex. As far as the clock, I remember it from a child in the 70s and always though it was odd there and looked completely out of place. Now I know!